Both elegant and inviting, this classic pattern serves as a wonderful complement to casual and relaxed dining environments. Constructed of extra heavy weight 18/8 stainless steel, this slotted serving spoon also boasts a bright mirror polish and attractive rounded rimmed handle. The item measures 11 1/4" in length and will add a classic touch to any dining area. These Regency Flatware Stainless Steel 11 1/4'' Slotted Serving Spoon made it easy for the guest to serve themselves without the spoon falling in the food. This is an elegant product that make any buffet style dinner looks nice. These spoons are so great. They are really sturdy and nice and shiny. Perfect for buffet serving lines. They stack nicely for storage too! These are a great deal and I'd buy them again for sure. These slotted silver spoons are another great addition to our catering events. We offer a meatball platter and these spoons work great for allowing the excess juice to drain out before plating the meatballs. I have a family of 6 and we always do family style dining for dinner and a number of lunches (since we homeschool and I work from home.) We currently only have two slotted spoons which isn't enough, since if we used them for lunch they may still be sitting in the dishwasher, so when I was getting a few other things from here I saw these, saw how cheap they were and though, "eh, might as well try them" Oh how glad I am that I tried them. We love them, they are a nice size, have a nice comfortable handle and the spoon portion scoops up just the right amount for the kids plates. These Regency Stainless Steele serving spoons look amazing. I use them on a buffet line and they are a good compliment to the Stainless Chaffing Dishes. With a bright finish and clean, smooth lines, these spoons provide an elegant solution for most buffet and catering needs without distracting from plating and display. I recommend both the slotted spoons and the matching solid version, #3031252830. The slots have just the right width. The handle is long and not too heavy. This size would be perfect for buffets or getting large scoops. Fancy fancy is all I can say . It looks beautiful. Very sturdy and shinny. Does the intended job. Great purchase. Will order more. Love the handle easy to clean. Another great item from Webstaurantstore! Love this line of serving pieces the bowl is perfect size for large buffet and handle is beautifully detailed. Good wait on the hand and looks beautiful by your chafing dish. These slotted spoons look fantastic on our buffet... Their mirror finish holds up really well to heavy use, they are heavy weight and will last us a long time! The Regency Flatware Stainless Steel 11 1/4" Slotted Serving Spoon is an elegant and gorgeous serving spoon for our dinner buffet that we cater for events. I highly recommend this spoon to anyone looking for class, elegance and the prefect price point. These are very sturdy and overall great quality. They are about the perfect size for serving on a buffet. Will definitely order more as needed. These Regency spoons are definitely a step up from the traditional buffet service wear that we were using before. It goes great with our Prima flatware. We use multiple sizes of these spoons for our buffet and they have all held up well. By far the best value on serving spoons I've found, especially when purchased by the dozen. They're heavy, elegant, and seem more expensive than they are. This is a solid serving spoon. They have a strong feel to them and work great. Highly recommend this spoon. They also polish up nicely and look great. this is such a nice item for the price paid. nice size and weight, the shine is great too. great site. thanks webstaurant you never disappoint. As with their serving spoon, this has a very long handle, and is nice and sturdy. The amount you can fit into a spoon is a little on the small side, but will works well. The slots drain well without letting things slip through, so that's working as intended. I really like the look of this line of serving utensils. They aren't expensive and yet they look very nice and polished. I bought the solid one and loved it so much that I had to buy this slotted one as well. This is a large slotted serving spoon suitable any food on a buffets that you would want some liquid drained from before serving. I do prefer these slotted spoons to perforated ones for this purpose. The spoon is made of heavy duty 18/8 stainless steel and feels great in your hand. It is substantial enough that even though it is quite long, it does not bend or deform. The handle has a simple line imprinted around the outer edge, which I think looks good in both casual and more upscale environments. I have use this spoon mostly for cooking in oil. It is deep so it makes picking things up a little easier and it drains seamlessly. It’s also very easy to clean. This is a very nice serving spoon. I use it with a burret server, and the handle length ensures that the handle stays cool when sitting in the server. Looks nice, it is very heavy, and so far, appears to be very durable--I HIGHLY recommend! Excellent serving spoon. The pattern is beautiful and the shine looks great. It doesn't dull when you run it through the dishwasher. Overall a very upscale look for the price. This Regency slotted spoon worked great for serving green beans in the buffet. The spoon feels strong and I will order another one for home. Regency slotted stainless steel serving spoon. This is an awesome buy. You can cook with this utensil and serving with this will be stylish. Great price! The Regency Flatware Stainless Steel 11 1/4" Slotted Serving Spoon has perfectly aligned holes that will not allow any food to fall through the holes. It is visually appealing and is sturdy enough to even pick up heavy-weight foods. This stainless flatware is a great basic option, and very cheap for the quality! We will be purchasing again in the near future. Highly recommend if you are considering! I bought this along with regency serving spoons and forks. It is a substantial quality and has a mirror finish. This size is large and more suitable for large pot and big buffet servings. More so for house parties rather than daily use for an average family, I do use it while cooking big pot meals. I love this Regency Flatware Stainless Steel 11 1/4" Slotted Serving Spoon . It's perfect to serve my meals at home. The polished stainless steel is great quality and you can actually see yourself on this spoon. I will definitely purchase this again. This is the perfect spoon to put in a pot of greens. The liquid drains right through and it grabs a big pile of greens with one scoop. Yummy! The regency serving spoon is a very nice serving spoon. It can be used for formal or informal settings. I plan to use it on the serving line for a anniversary party buffet. The spoon is heavy duty without being too heavy. It also has a great price. We purchased these serving spoons--- the slotted and unslotted-- to use on our self serve buffet tables. They work beautifully and compliment the chafing dishes. Nice and shiny for elegant service. Very good portion and long handle for easy serving. The price was very good for the quality of the item. Works great and it has a great look to it. We have used it for many things, but it has been a great serving spoon. This 11 1/4 stainless steel slotted serving spoon is awesome. It's perfect size even. You can use this to scoop out food that may have unwanted juices. This is a very nice serving spoon and will work well on our daughters' wedding receptions. They are nice weight and have a a very pretty finish. This spoon is very well made and very sturdy, you can tell it is for commercial use, will last a lifetime in the kitchen. Buy a couple of them you will be glad you did. I purchased these sppons for use at our weekly potluck after church. They are strong, attractive, and the long handles make serving easy and sanitary. This serving spoon is an amazing value for the quality. The finish is absolutely beautiful! I have power washed it many times and it still looks brand new. For the price, these are very nice, classic looking slotted serving spoons. The go with pretty much any place setting on any buffet, because they are pretty plain. The fact that the regency set is all matching is a beautiful things. The slotted spoon works great serving our guest vegetables, potatoes, and even pastas. I was quite surprised with the quality of this Regency Stainless Steel Slotted serving spoon. I had planned to just use it for my everyday cooking needs, but it is quite nice and will be used for serving and tableware as well. It is strong and seems heavier weight, heavy duty as well. I am quite please with this spoon and will be looking to purchase more pieces from this line in the future. I love these spoons (well, as much as you can love a slotted spoon). They do the job, show up on time, and never complain. Plus they never break under pressure. Nice serving spoon. Strong enough to handle heavy foods. Polishes up nicely and makes for an elegant presentation. Need to get the entire set real soon. It really is amazing to get a stainless steel, large serving spoon at this price point. I always find myself short on slotted spoons and this takes care of it. The Regency Slotted Serving Spoon is perfect for our watering or buffets. It adds a nice touch to the look and feel of the buffet. It is heave yet easy to handle. I ordered these for serving at my wedding and now every event I cater, I am asked to use these. I am always torn between using them at events because I love using them at my home as well lol! The Regency Flatware Stainless Steel 11 1/4" Slotted Spoon is solid and made from a heavy weight stainless steel which ensures the durability and longevity of this product. The rounded handle design is simple and attractive. This spoon is versatile for many uses. It is very long and that is my favorite part. The design is classy and the price is great. These are great slotted serving spoons. They are heavyweight, no way they are going to bend. The finish is very shiny. It goes through the dishwasher with ease. It is a nice size. I am very pleased with my purchase. This is a lovely slotted serving spoon that is great for serving large amounts of vegetables, pasta, anything that needs a slotted spoon. After many uses it looks brand new. Bought these for daughters wedding. Will be great to use .Very nice spoons and heavy. The price was great. Nice enough to use for any function. We use these for our cold salads on our buffet service. Really attractive. I even bought some to use at home. Nice to have matching serviceware at the family dinner table. We use Regency stainless steel serving utensils for all of our buffet items. The whole Regency stainless steel line of utensils looks very professional and they are incredibly affordable too. The metal serving utensils are sturdy and easy to clean. A great product for all of your serving needs. The Regency Flatware Stainless Steel 11 1/4" Slotted Serving Spoon is perfect for serving any dish and easy to clean up. We bring them to every catering event and keeps us looking professional and efficient. Love this slotted spoon! It goes great with my other flatware and is very sturdy. I have washed it several times in the dishwasher and it still looks great. Extremely happy with our purchase. We bought 6 serving spoons and they look gorgeous, very sturdy, long handle- perfect for buffet. Definitely, recommend. Very affordable and great quality. The handles could be a little longer, but these have a nice weight to them, and haven't bent under weight or usage. Slots are the perfect size for most items. What a great buy! love this very elegant looking serving spoon. I would buy again. thank you once again for another exceptional products. you never disappoint!!! So happy with the regency! What a gorgeous finish on this product.. We purchased several variations of this product for addition to our buffet service items.. Love them! Perfect slotted serving spoon. I love the extra long handle, and I really love the elegant look. This line is so durable, and well made. I originally just purchased the iced tea spoons because they are so hard to find. I was sold at that point. I have been slowly converting all my utensils over to the Regency line. Love it. The slotted spoon features are perfect for us! The weight and construction are top quality. We will use the spoons we ordered for years to come. The shine/finish is very presentable. The quality is exceptional for the price, and it looks very good on buffets. It is the perfect length and weight that a serving spoon should be. This is a fabulous serving spoon at a fabulous price. It is heavy. It has a great shine and looks very good on a buffet line. I purchased two of these spoons and I really need a few more because they are just perfect in both the weight and length. The quality far exceeds the cost. Great spoons to use in buffet lines. Nice long handles and a great serving size. These appear elegant for serving at parties and banquets. Great price and great value. This is a great service spoon for items that have excess liquid like stewed vegetables!! Very attractive material!! Nice item to have for banquet events!! This slotted serving spoon is great. It's great to be able to pick up a shrimp but not all of the white wine garlic sauce it was in. Excellent value for this substantial slotted serving spoon. Part of a classic flatware pattern, these utensils are heavy and feel comfortable to use. Buy three, I did. Not quite as good-looking as the silverware set -- in particular, the polish isn't as lustrous and the design a little more mundane -- but it does the job, and that's what's important! These Regency Slotted Serving Spoons are so well made and look like you paid a whole lot for them. They are so nice and will really last. I WAS VERY SURPRISED AT THE WEIGHT AND FABULOUS DESIGN OF THIS SLOTTED SPOON..A BARGAIN AT THE PRICE AND DISH WASHER SAFE, GREAT FOR A SERVING SPOON.. These are very good quality serving pieces, I priced out some others and you just cannot beat their price! They look and feel better than anything I came across other places. 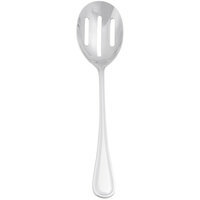 I don't think I could find a spoon like this that would have a better quality or price. I ordered several for a wedding reception and they were perfect. I have been purchasing my serving utensils at my local Sam's club and these are so much better and less expensive. I'll continue to purchase mine here. This is a great serving spoon , for the money that you pay, nobody can bet this price, and this is the best in the market. The regency serving spoons look very classy. They are too large for smaller dishes, but for a steam tray or larger plate, they are elegant and functional. I'm glad I purchased both the slotted and non-slotted. We serve weekly meals at church on Wednesday evenings; didn't have enough of the serving spoons. We are very pleased with the quality of these spoons. Perfect for salads and vegetables. We use them for our family style events. Our clients are seniors and they are the perfect size for them. Very nice - and very large! This serving spoon should work out very well on a buffet table to serve from a chafing or other large dish. Very pretty, too - and it matches the Regency flatware!